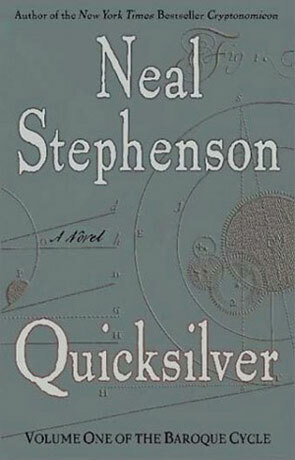 Quicksilver is the first volume of The Baroque Cycle by Neal Stephenson. The thing about Neal Stephenson is that he usually presents something new and fantastic that runs as the core of his books. Diamond Age has the Primer, Cryptonomicon has the economics of virtual money (or cryptography if you want), Snow Crash was an explosion of new and crazy stuff. Always something that would provoke some wonder and leave you wondering about the future (the real one and the fictional one) when you closed the book for the last time. Not that Stephenson is an idea man only, he also creates interesting characters, that you care about and writes good prose. But for me the core has been the sense of wonder. So I was a bit nervous when I started on Quicksilver – now much new, now much sense of wonder can there be in a historical novel? Well, the short answer is ... a lot. But the real and, from my point of view honest, answer is a bit more complicated. I'm not an historian specialising in the baroque area, so I really don't know, but Stephenson seems to have gone a long way to pictures the events of the last of half of the 17th century, as correctly as possible within the limits of the novel. As for the main historical events he's sticking to what we know - or what most historians can agree on anyway. This turns everything upside down for the typical Stephenson/Science Fiction reader. Normally you try and suspend your disbelief and/or accept unknown new stuff and things that you think, or know, are impossible (say FTL). You try your best to take on and accept the world/future, the author is using as a vessel for the story (sometimes there's not much more than the vessel it self). How does that work for a historical novel? Well, as long as the author sticks to reality and the vessel keeps pointing towards the future as we know it (our present), there's not much need for suspension of disbelief is there? Daniel Waterhouse. Fictional character that goes to school with Isaac Newton and take an active role in the Royal Society (group of scientists). Now my problem with Daniel Waterhouse is twofold. Firstly you know he's fictional and that he's never going to do anything really important. Well, maybe he did, but then again, you are never really sure that things wouldn't have happened anyway. Secondly, he doesn't seem to have much internal life – most of the things he does are reactions to external stimuli or just keeping on doing what he was doing due to lack of stimuli. I may be hard on him, but he does himself regonizes that he probably will not have left a big mark on the world. Daniels ends of as a vessel for the ideas of the important scientists of the day and their political liaison to the powers of the time. So a lot of interesting things happens around Waterhouse and he has an almost magical ability to be in places of interest (he has to as we see most things from his point of view). Eliza. The story of Eliza is parallel, but mostly unrelated to the story of Waterhouse. Where Waterhouse is located mostly in London and works in the world or interest of science, Eliza is based mostly in Paris and Amsterdam and works with money and trade. Now the historical development of economics, are quite interesting and there's some interesting stories about the start of what we today, know as the stock and commodity marked. Also Eliza takes an interesting in science, so she gets to meet a lot of the same people as Waterhouse. And Elize her self is strong and will full – she could goes places. In fact she ends up as a spy in Paris, and then the story kind of goes of an a quite uninteresting tangent, as Eliza writes endless (encrypted) letters about the actions of the Parisien nobility and European politics. Her story does come a bit more alive towards the end, but it took quite a bit to get there. Eliza again lags depth, she has some fairly big things happening to her, but we never really see a reaction from her. It's okay for her to be tough and calculating on the outside, but if I'm to care for her as a character, I need to know what makes her tick. Jack Shaftoe. Vagabond king. Now here's an interesting character. But it as to soon becomes clear that Jack is just a stepping stone for Eliza, something that can help her into the light and create a bit of interesting and colour full background for her. I really would have liked to see more of him. Now there are lots of other characters both fiction and real, both important and not that important, but these three are the ones that tells the story. I must admit that I'm kind of unsure what it is that Stephenson is try to tell me. Is it the story of Waterhouse and the story of Eliza? Is it the history of science? The history of politics and war? The history of economics? All of the above? None of the above? If the answer is “All of the above” or “none of the above”, I think Stephenson does fairly well. He doesn't really succeed in getting close to any of the topics, in getting into the meat of any of it, but as an overview and as a way of conveying an feeling about a period of time, he does really well. I know that this is the first of three books, but if it's just a warm-up for the real story, I must admit that it's really testing my patience. A thousand page long introduction? Neal Stephenson has written other such greats as Cryptonomicon and now Quicksilver. Quicksilver is an epic 4 part series, Quicksilver Volume One in Baraquoe Cycle. This book is historical fiction based on 18th Century Thinking, greats such as Isaac Newton, Robert Hooke, Louis XIV, Gottfried von Leibniz, Samuel Pepys, Bishop John Wilkins and the William and Mary and many others are mentioned in this novella. The story is basically a tour of science, politics, history, religion, and the way in which all of these themes interplay with each other with their characters. From Vagabond King's to Whore Harem's, this book has a wide range of characters. Calculus, Invention, Theory, Mathematics, Engineering, History, all are thrown together as these characters yearn to define themselves in history as the greats we know them to be amidst the ever changing new world with all its political plots, changing empires, religious rules and structures. Definately worth your time, though it is a hefty read at 800 pages, and 3 more are left. If you've ever read any of Umberto Eco and his historical fiction and enjoyed yourself, then this book is for you. It takes place in a time period of massive wars, religious furver, and spans continents from Europe all the way to the Newly settled Colonies in America. 1700's at its best. As I said before, definately worth a read. Enjoy. Written on 24th February 2004 by TC.